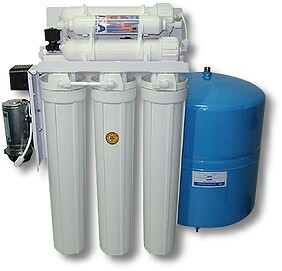 This free standing RO system is only 30 inch in height. but it can produce 400 gallons per day of pure water. 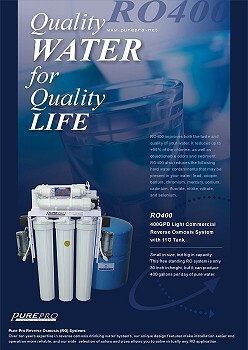 RO-400 improves both the taste and quality of your water. It reduces up to +99% of the chlorine, as well as objectionable odors and sediment. RO-400 also reduces the following hard water contaminants that may be present in your water: lead, cooper, barium, chromium, mercury, sodium, cadmium, fluoride, nitrite, nitrate, and selenium. Our RO-400 comes complete with a 11 gallons water storage tank and all the necessary fittings, installation kits, 1/4" tubing, and a long-reach chrome faucet. All you need is a few household tools. Installation usually takes less than an hour. Two high rejection membranes, Each membrane is 200GPD at 100psi.